With these few words, we would like to thank you very sincerely for having accompanied and advised us so well, following the death of our mother, Madame Monique Fontaine Gaudreault. We also want to highlight your availability, professionalism and kindness throughout these difficult times. Cordial greetings. It's been three years now that I lost my father very suddenly and I thank Michelle Fortin and the whole team for allowing me to get through this overwhelming event with so much humanity and professionalism. You are trustworthy people, for whom each person is dear to you. Thanks. My mother, me and my partner Stéphane Boivin, would like to thank you. We had an excellent service at my father's funeral last October. This exceeded our expectations. Again, thanks to you and your team. We will not hesitate to recommend you. Nathalie Ilko. Mr. Cenac, I would like to thank you for your services and professionalism throughout my mother 's funeral. This being written, I will not hesitate at any time to recommend you and your house to take care of our deceased. Please accept, Sir, the assurances of my highest consideration. M. LAJEUNESSE, J'AIMERAIS VOUS REMERCIER POUR VOS SERVICES. JE VOUS ATTRIBUE UNE PART IMPORTANTE DANS LE BON DÉROULEMENT DES FUNÉRAILLES DE MA MÈRE. J'APPRÉCIE ÉNORMÉMENT ET J'AURAI DE BONS COMMENTAIRES SUR VOS SERVICES ADVENANT QUE L'OCCASION SE PRÉSENTE. MERCI ENCORE! Mr. Cenac, just a short note to thank you very much for the quality of the service. Many thanks also to Father Lapointe for the celebration of the liturgy of the word. It was much more than expected. Mr. Lajeunesse, we would like to thank you for your presence and your follow-up. Your support has been invaluable. Several of us emphasized your professional and discreet work during the celebration. A big thank-you!. - Ginette et Robert Grégoire. Mrs. Fortin, Thank you for taking care of our brother Christian, he was very beautiful. Your professionalism and dignity in this passage of life have helped us to continue without it. Hello Mr. Lajeunesse, we appreciate your loyalty and we thank you !. Hélène Tremblay and Serge Blanchard. Mr. Robert Cenac, thank you for the very good service you offer and all the attention you've given. Thank you for the help in all the documents you filled out when Lucien Therrien died. We do not hesitate to recommend you. Mr. Lajeunesse, on my own behalf and that of my family, I would like to thank you for the excellent work on the death of my wife Lise Joannette. Thank you for all Mr. Cenac. The comments were positive and all appreciated the organization of this commemorative day for the death of my brother Stéphane. Thank you very much! Mr. Robert Cenac, Thank you for your kindness, your listening and for your excellent service. - ulie Séguin (nièce de feu Germain Séguin). A special thank you from the Rondeau family. Thank you Mr. Cenac for your good service. It was very appreciated. Mr. Lajeunesse, on my own behalf and that of my family, I would like to thank you for your availability and professionalism. Yesterday, despite the trouble, it was a memorable day to mark the departure of our mother. M. GUY GRENIER Mr. Lajeunesse, I was very pleased with your visit because you answered all my questions very professionally and accurately. I will be happy to recommend your company to others. I wanted to take a moment in my name and my family to thank you. Friday the 31st of August took place the funeral of our mother Lise Robidas Préfontaine. An event to which we are never prepared. You and your staff helped us through this moment. Thank you for everything! A short note to thank you for your professionalism and kindness at the funeral of Madame Carole Bonin. Everything was as we had discussed, simplicity ... - dignity ... and it was very appreciated. Certainly we do not wish to use your services regularly ... But it is in the order of life, and rest assured that we will continue to do business with you ... (Hoping in the distant future ...). Moreover, it will be my pleasure to recommend your home to relatives and friends who will go through these difficult moments. Once again Thank you, and we will surely have the opportunity to talk to you about the grounding of my sister-in-law. A big thank you from our family. Discreet courtesy and impeccable service. We are very happy with the way the evening unfolded, despite all the sadness in our souls and our hearts. A thousand thanks for your warm welcome. Excellent service, the staff is very attentive, thank you very much! To Mr. Patrick Lajeunesse, a special thank you for your sensitivity and your efficiency for this particular situation. Your calm and your patience my reassured, thank you. Our brother Ronald died and all his arrangements were made at your Salon On Boul. Ste-Foy of Longueuil. Everything was perfect, all the people who worked there that day were all OK and friendly. 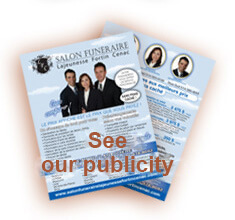 Thank you very much, be sure that we will be pleased to talk about your Salon. M. Cenac, the most sincere thanks for your excellent services at my husband's funeral on April 22, 2017. Your sympathy and organization have been a great help to get through this difficult time. Thanks also to your staff. Mr. Lajeunesse, thank you, for the respect and for the excellent funeral service. The most bitter tears spread on the graves are For the words left unsaid and the deeds left.